Murukku is a very popular tea-time snack. It is made with Urad dal and rice flour in South India. In Maharashtra and Gujarat also they make these with a slight variation in the recipe mix. 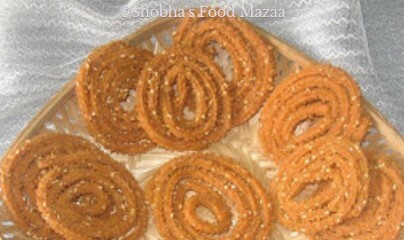 Specially on Festive days these are served along with the sweets. 1. Mix the above ingredients with the help of water into a soft dough. 2. Now, take some of the dough, mix it well so that it becomes softer. Put this dough into the murukku-maker and make murukkus as shown in the pic. NOTE: If the murukkus are breaking, that means you have not mixed the dough soft enough. Try to make it very very soft by adding a little water. 3. Now, deep fry the murukkus till golden brown. Remove, allow them to cool and store in a container.